UPDATED: On the Move: Pillar, Hollon, Barreto, Kawasaki, Glenn . . .
Wow, Blue Jays fans. Wow. Yesterday was a busy day and I just had to be spending time with my lady friend and then umpiring a couple of softball games so I wasn’t able to update everyone on events as they happened. I’ll post what I know for sure and then I’ll update this post as the “ripple effect” moves come down the line. With a couple of injuries and the trade of Emilio Bonifacio, the Blue Jays needed another outfielder (or two . . . keep reading) and the first to be announced was the promotion of Kevin Pillar. Pillar took Bonifacio’s place on the 40-man roster and is well deserving of his promotion. I wrote about Pillar surpassing Anthony Gose on the team’s depth chart about a month and a half ago, and while most think that Pillar won’t have as great of a major league career as Gose will, he is probably the more ready to perform at the big league level now. He went 0/4 in his ML debut but, from what I heard, he made very solid contact. Talking to people in Bluefield, Lansing and Manchester, New Hampshire this summer, Pillar has left a trail of people extolling his performance, his talent and his work ethic. I just missed him in New Hampshire (he was promoted about a week before I got there) and will miss him again in Buffalo tomorrow but everyone I spoke to raved about Mr. Pillar. His performance speaks for itself. In just over 500 minor league at bats (which also shows his durability) he’s hit .307/.353/.461 with 9 home runs and 23 stolen bases. He’s also been playing excellent defense in any of the outfield positions. Pillar doesn’t have a ton of power, but he does have gap-to-gap power. I was actually going to write an article arguing that you would get similar (if not better) production in left field from Pillar than Melky Cabrera. It looks like we’ll get the chance to see for ourselves. Munenori Kawasaki also got the recall to the majors. With Rasmus going down and Bonifacio getting traded, Kawasaki will fill in on the infield and Pillar in the outfield. You all know about Kawasaki and if you don’t, just head to one of the other, bigger blogs about the Jays. You’ll be Kawasaki-ed out of your mind. On the radio broadcast last night, it was being reported that Anthony Gose will return to the Blue Jays as well. Gose has had a rough season in Buffalo and while I can’t certainly say that he hasn’t been giving it his all, people haven’t been raving in quite the same way about him the way they have been about Pillar. That said, Gose has been turning things around over the past few weeks. In his past 10 games, Gose is hitting .316/.333/.526 with 3 doubles, a triple and a home run to go along with seven stolen bases (without being caught). The downside to that ledger is the fact that he still strikes out a TON, with 14 Ks in the last 10 games and 121 strikeouts over the 105 games he’s played this season. We’ll see if a reunion with Chad Mottola (his hitting coach from last season with Las Vegas) will help spark a return to the point where he’s an offensive asset. To add an outfielder to the Buffalo Bisons (they’re losing 2 to the Blue Jays), Brad Glenn has been promoted from New Hampshire. Glenn was an Eastern League All-Star this year with the Fisher Cats and was repeating the level after being drafted in the 23rd round in 2009. Glenn is a power hitter who diversified his portfolio this year, raising his batting average 25 points and his OBP 43 points over his stats (in almost exactly the same number of at bats) a year ago. Despite hitting 2 fewer home runs that 2012, he has a higher OPS this year (by 63 points), mainly by improving his overall hitting game (more walks, higher batting average). He also reduced his strikeouts from last year, earning his call up to Buffalo. The 26 year old will make his Triple-A debut with the Bisons. While I’m sure there will be ripple effects that haven’t been announced, right now, the last two moves being announced come from the Blue Jays’ Gulf Coast League squad. 2013 2nd round pick Clinton Hollon (who may out-do Marcus Stroman when it comes to Twitter activity) was tweeting up a storm about his promotion to Bluefield. Hollon has been outstanding in his professional debut in Dunedin and is looking forward to getting his abilities tested at the next level. Hollon has thrown 12 innings so far and has not given up a run in the Gulf Coast League as an 18 year old. In fact, he’s only given up 2 hits and three walks while striking out 10. Scouting reports have been that he’s got a mature sense of pitching to go along with his 92-94 mph fastball and well developed slider. Hollon might not add any velocity due to the fact that’s he’s “only” about 6’1″ and 195 lbs already, but with a solid fastball and already one well developed breaking ball, he could be a force in the coming years. Finally, one of the Jays most exciting players in the GCL, Franklin Barreto, is accompanying Hollon to Bluefield. Barreto is a 17-year-old Venezuelan international free agent signing who will probably split time with Dawel Lugo at shortstop in Bluefield. While scouts have said that he’s probably not going to end up at short (one writer told me that he thinks Barreto is a center fielder), Barreto has shown that he can hit beyond his age level. In his first pro season, Barreto has hit .299/.368/.529 with 16 doubles, 6 triples and 4 home runs. While his defense is a work in progress, “Franky” (as Hollon refers to him on Twitter) has shown that he can hit and Barreto will add nicely to Bluefield’s already potent offense heading down the stretch and into the playoffs. UPDATE: I had been wondering if SS Dawel Lugo would remain in Bluefield after Franklin Barreto‘s promotion and I’ve got my answer now. Dawel Lugo has been promoted to Vancouver and will probably become the every day shortstop for the rest of the year. The 18 year old from the Dominican Republic has been one of the offensive leaders for the first-place Bluefield club. He was hitting .295/.315/.468 with 11 doubles, 2 triples and the team lead with 6 home runs. Lugo’s a decent fielder who’s got an erratic arm at times but can definitely cover the shortstop position (whether he remains there in the long run is up for debate). While he doesn’t strike out a lot, the biggest knock on Lugo is that he hasn’t really shown any patience at the plate thus far, taking only 5 walks. I’ve seen him swing for almost anything in the vicinity of the plate and, while he shows the ability to make solid contact, he won’t be too patient. Word is also coming down that Matt Boyd (check back in for our podcast with an interview with Boyd) has been promoted to Dunedin. While this hasn’t been made official yet, Boyd tweeted that he’s on his way to Tampa (which is the closest major airport to Dunedin, about a 40-minute drive away). 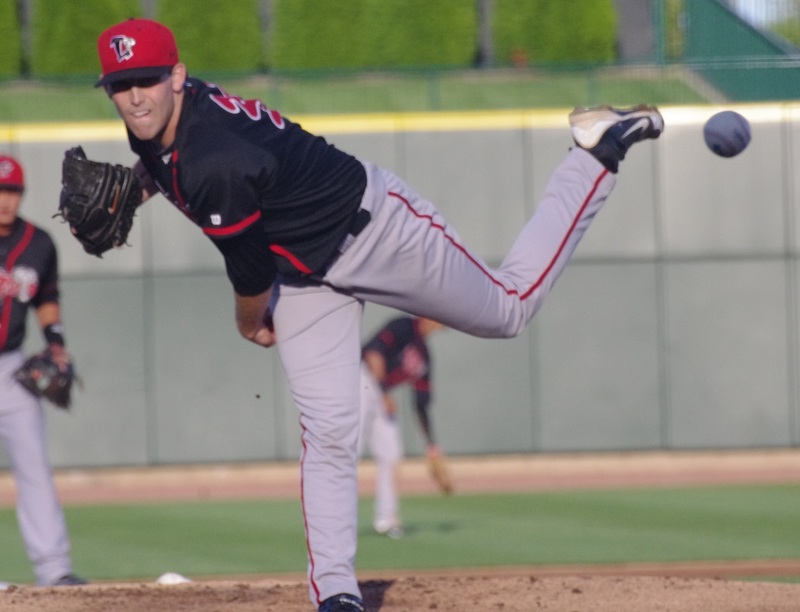 Boyd has been outstanding in his professional debut, putting together an 0.64 ERA through his first 14 innings with the Lansing Lugnuts. He’s also got 12 strikeouts and just one walk and has given up only 7 hits. You can find my scouting report on Boyd here. Pillar did look good last night, including his HON-worthy catch in left field to kill the Red Sox’ momentum that was building while Rogers was trying to get out of the inning (Esmil owes Kevin a drink or three). Pillar’s contact was solid in his two liners to right field; A little more to the right or left and Victorino probably struggles to get to it in time. He struck out on a Workman curve-ball that was giving everyone fits and while we hoped he’d hit a walk-off Hallmark Moment for his first night in Toronto, that curve ball is dirty: (95 mph fastballs down to 75 mph curve balls; are you kidding me!?). Lester and Workman isn’t a pleasant welcome wagon. Thanks for the comment, Hil. Pillar will certainly be tested in the majors!